Steve Borgatti is the Paul Chellgren Endowed Chair of Management at the Gatton College of Business and Economics at the University of Kentucky, where he is a member of the LINKS Center for Social Network Analysis. He received his BA in Anthropology in 1977 from Cornell University, and his PhD in Mathematical Social Science in 1989 at UC-Irvine. Prior to working at Kentucky, Steve was Professor of Organization Studies at Boston College, and before that was Associate Professor of Sociology at the University of South Carolina. Steve is a past-president of INSNA, the professional association for social network researchers, and was awarded both INSNA's Simmel and Richards awards. 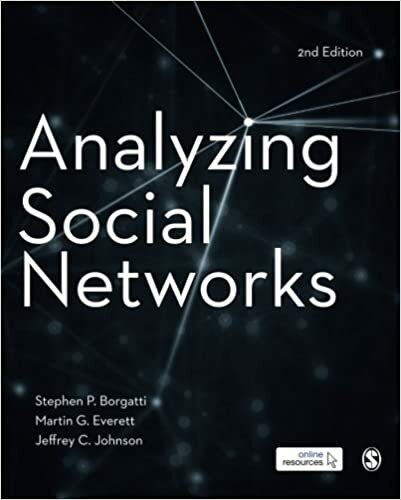 He is co-author, with Martin Everett and Lin Freeman, of the UCINET software package for social network analysis. For more information, see home page, publications and citations. Contact Steve at steve.borgatti@gmail.com. Martin Everett has a BSc in mathematics from Loughborough University and an MSc also in mathematics from Oxford University. He continued at Oxford to complete a DPhil which was a jointly awarded by mathematics and sociology. He joined the University of Manchester in 2009 having previously worked at East London, Westminster and Greenwich universities. He helped co-found the Mitchell centre for social network analysis which evolved from the existing Manchester Social Networks Group. The centre is named after Clyde Mitchell who was a founding father of the discipline whilst he was a Professor in Manchester. In addition Clyde was his sociology supervisor for his DPhil at Oxford. For more information, see home page, publications and citations. Contact Martin at martin.everett@manchester.ac.uk. Jeff Johnson is Professor of Sociology at Eastern Carolina University. He is interested in the influence of technological and environmental factors on the organization of work, leisure, and cognition, particularly in groups in extreme and isolated environments. He has focused a major portion of his teaching and research program on the use of social network theories and methods for understanding social structure and organization. Recent substantive interests have focused on the relationship between cognition and social structure. The bulk of his research has focused on the maritime peoples of the Pacific basin, especially the insular Central Pacific, the Caribbean, and coastal North America. Interdisciplinary in both training and orientation, Jeff has had teaching experience in economics, anthropology, sociology, statistics, and Pacific studies. For more information, see home page, vita and citations. Contact Jeff at JOHNSONJE@ECU.EDU.